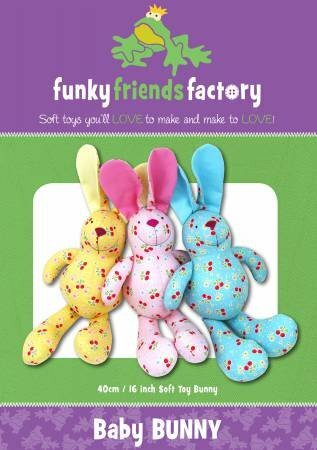 Baby Bunny is a truly baby-safe toy, with sewn on facial features, there is nothing for babies to chew and choke on! Bunny is simple to sew and makes a gorgeous gift for a new mom, as a baby shower gift. Baby Bunny can be made from most fabrics, non-stretch fabrics eg. cotton drill, cottons, corduroy and quilting fabrics, as well as non-stretch fabrics, like fleece, velour, chenille and flannelette.